Richmonde Hotel Ortigas, Philippines offers exciting deals and promos for you. Check out our offers below for a more enjoyable stay at this Ortigas Center hotel. Get the best deal on your Richmonde Hotel accommodation only at the hotel’s official website. Find not only an array of rates, packages, and promotions to fit your needs and budget, but you’re also assured of the lowest rates on the web with Richmonde’s certified “Best Price Guarantee”, where with every confirmed direct online booking, the hotel will match any lower rate (for the same booking details) which you may find on another website. So travel smart and book only at Richmonde’s official site. Richmonde Hotel Ortigas will make available the best guest room price for the hotel (the “Best Price Guarantee”). “Richmonde Hotel Ortigas Website” are the websites owned or operated by or on behalf of Richmonde Hotel Ortigas bearing the logo and branding of Richmonde Hotel Ortigas. In the unlikely event that a lower price at Richmonde Hotel Ortigas is made available on a non-Richmonde Hotel Ortigas website (the “Competing Price”), upon its receipt of a claim that satisfies these Best Price Guarantee terms and conditions (the “BPG Terms”), Richmonde Hotel Ortigas will honor that Competing Price. A claim may be rejected by ? ?Richmonde Hotel Ortigas if it is incomplete or concerns a non-Richmonde Hotel Ortigas website. For the Competing Price to be valid, it must be a currently available lower published online room price for ? ?Richmonde Hotel Ortigas , the same stay dates, the same number of guests, the same room type, with a similar view and room size, and include similar or additional value-added amenities (e.g., free breakfast). 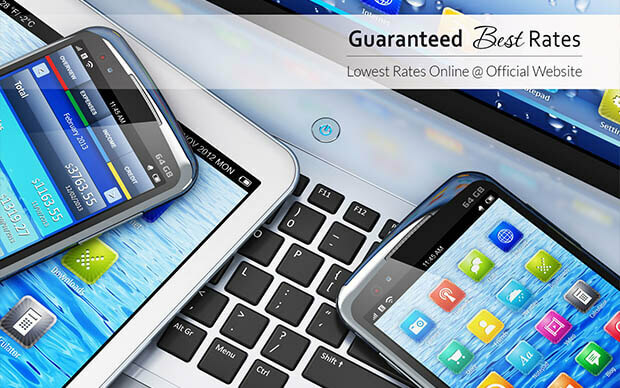 The Best Price Guarantee will be suspended during times where the Richmonde Hotel Ortigas Websites or certain prices are not available due to an outage, a technical issue or a circumstance beyond Richmonde Hotel Ortigas\’s reasonable control. Richmonde Hotel Ortigas may at any time and without notice terminate or restrict a person\’s ability to submit a claim under or otherwise benefit from the Best Price Guarantee, if in its sole discretion Richmonde Hotel Ortigas determines that such person has: (1) acted in a manner inconsistent with applicable laws or ordinances; (2) acted in a fraudulent or abusive manner, (3) submitted multiple invalid Best Price Guarantee claims; (4) failed to stay at Richmonde Hotel Ortigas Hotels after receiving approved Best Price Guarantee Claims; or (5) breached any of these BPG Terms. For some refreshing goodness, enjoy these sweet, ice-cold drinks any time of the day. 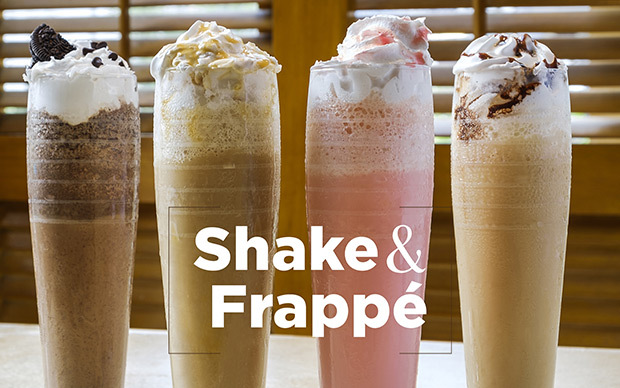 Get your smoothie, milkshake and frappé at the Lobby Café, the Richmonde Café, or The Exchange. 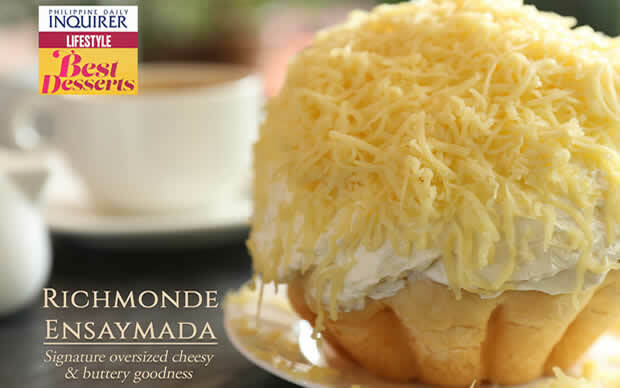 Richmonde Hotels’ signature Ensaymada has been a favourite of many for years. And now, it has the distinction of being hailed as one of the metro’s best desserts by premier “best dessert” author, Ms. Vangie Baga-Reyes. During the launch of Ms. Reyes’ latest “Best Desserts Book” published by Philippine Daily Inquirer Lifestyle last February 6, 2017 at SMX Convention Center at SM Aura Premier, the Richmonde Ensaymada officially joins the honor of being touted as one of the “best” together with other divine creations of Richmonde Hotel, namely the Richmonde Chocolate Cake (Book 1, 2014) and Richmonde Bibingka (Book 3, 2017). Order this buttery, cheesy baked goodness anytime at Richmonde Hotel Ortigas’ Lobby Cafe. Bulk purchases for take-out are also available with advance orders. Just call (632) 638-7777. Wake up bright and early daily and make a habit of starting each day with a hearty breakfast to fuel you at work or at play. 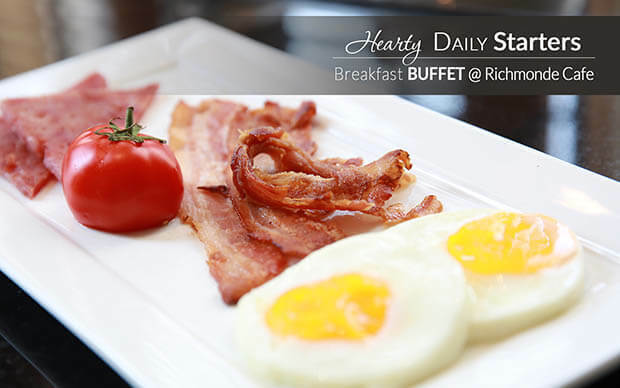 Look forward to a yummy and filling meal at Richmonde Cafe’s breakfast buffet served everyday from 6am to 10am. Expect morning favourites like eggs and omelette made a la minute, bacon, toast and other assorted bread, sausages, pancakes, French toast, cereals, yoghurt, and popular Filipino dishes like tapa, tocino, and adobo. Breakfast buffet is priced at PhP 715nett. Children 6 to 12 years old get 50% discount and toddlers 5 and below eat for free. 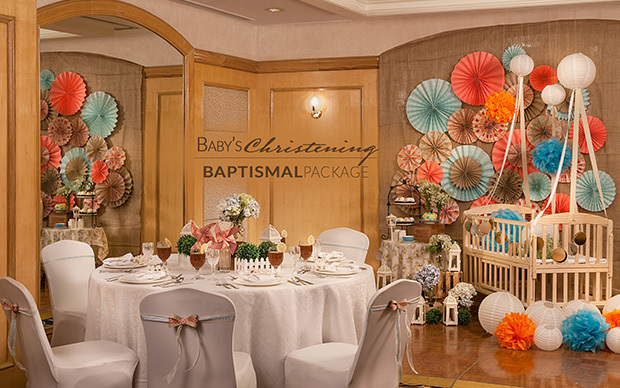 Celebrate baby’s christening with family and friends at Richmonde Hotel Ortigas and enjoy the fabulous amenities of the Baptismal Package. Live up your role as doting parent and concentrate on showing off your precious child to gushing guests as Richmonde’s party experts handle everything else. Rates start at Php58,000 nett for a set menu and Php63,500net for a buffet spread for the first 50 guests of your lunch or dinner reception. For inquiries and bookings, call Banquet Sales at (632) 638-7777. For the meaningful events in your life, let Richmonde mount your historic affairs with all the essentials for a festive and unforgettable experience. 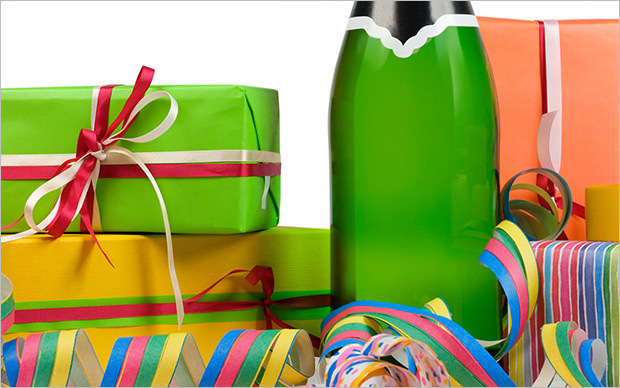 Package is good for a minimum of 50 persons. All inclusions are subject to change without prior notice. For inquiries and bookings, call Banquet Sales at (632) 638-7777 or send an email to rhobanquets@richmondehotel.com.ph. Because experience is the best teacher, hospitality management students can complement their textbook lessons with a room & banquet package complete with a hotel stay, lectures from veteran hoteliers, and a tour of the hotel’s facilities. 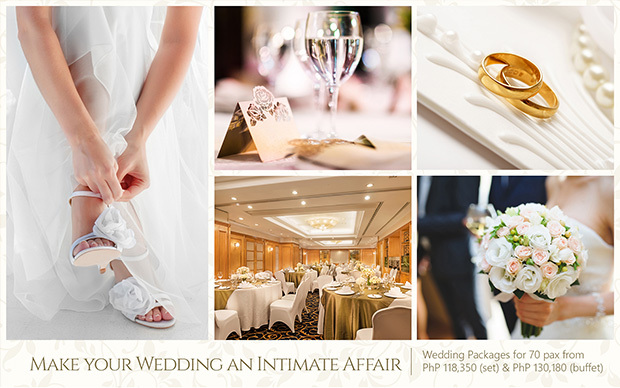 Begin your fairy-tale ending at Richmonde Hotel Ortigas where every bride’s wedding whim for an intimate yet fabulous celebration is granted. Leave it to the capable hands of Richmonde’s professional Banquet Sales Team to provide every bride & groom with a celebration complete with all the elements that spell romance for a lifetime. 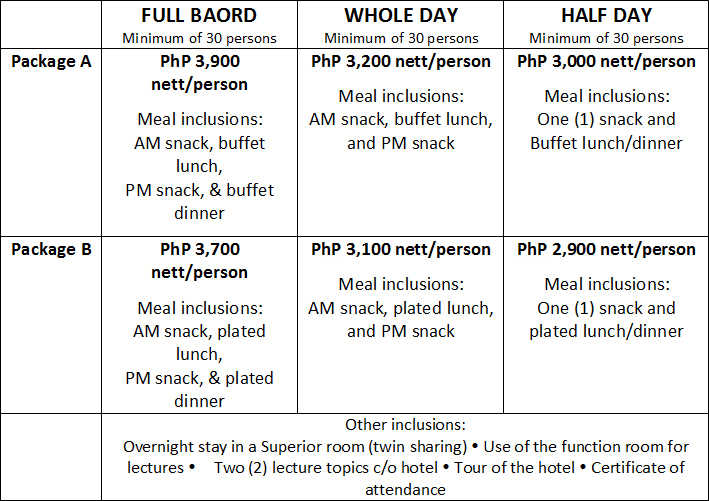 Package rates good for 70 persons start at PhP 118,350nett for plated meals, and PhP 130,180nett for a buffet feast. For inquires and bookings, call Banquet Sales at (632) 638-7777. At Richmonde Hotel Ortigas, corporate affairs are always designed for success because clients can concentrate on the bigger picture, while the hotel’s efficient and professional Banquet Team takes care of the “little things” that matter. From its strategic address and well-equipped function rooms, to its sumptuous food offerings and impeccable personal service, Richmonde Hotel Ortigas provides all the essentials for a successful executive forum. And with its Conference Packages, you get easy options with great value for your money, plus flexibility so your unique requirements can be addressed in Richmonde’s distinct, personal way. Conference Packages include flowing coffee/tea for AM/PM snacks, set or buffet lunch with one round of iced tea, meeting amenities, and WiFi access. Rates start at PhP 1,365nett per person and PhP 1,385nett per person for whole day affairs with AM/PM snacks and set or buffet lunch, respectively. 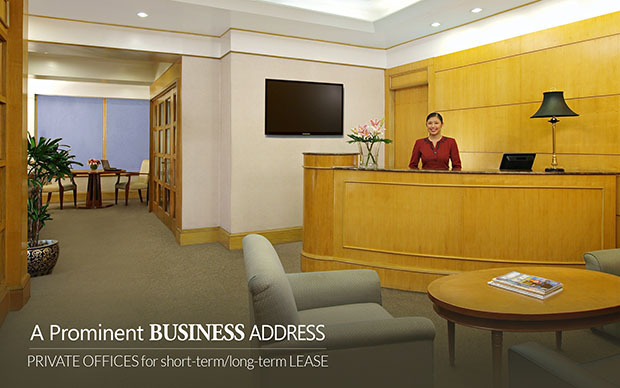 Give your business a prominent office address at Richmonde Hotel Ortigas. Private offices at the hotel’s Business Center can accommodate up to 4 persons and are available for short-term or long-term lease. It’s perfect for start-up businesses, small enterprises, or as a transition space while setting-up your permanent office. Rental already includes office furniture, electricity, telephone line with free local calls, internet access, and support services like reception and secretarial services, and 24-hour security, to make settling-in simple and effortless. 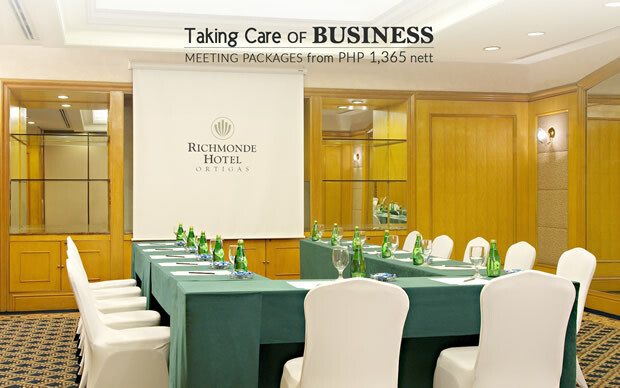 For inquiries, please call the Business Center at (632) 638-7777 or send an email to rhobc@richmondehotel.com.ph. Find the fitness regimen that works for you at Richmonde Hotel Ortigas’ Health Club. Get personalized assistance and customized exercise programs from professional trainers plus the use of modern fitness equipment and machines, and a soothing heated indoor pool. Membership rates are also affordable, and include access to the gym, locker room, steam and sauna rooms, and pool anytime during regular operating hours (6am to 9pm, daily); services of personal trainers on certain days and time; and complimentary use of towels and locker room amenities. 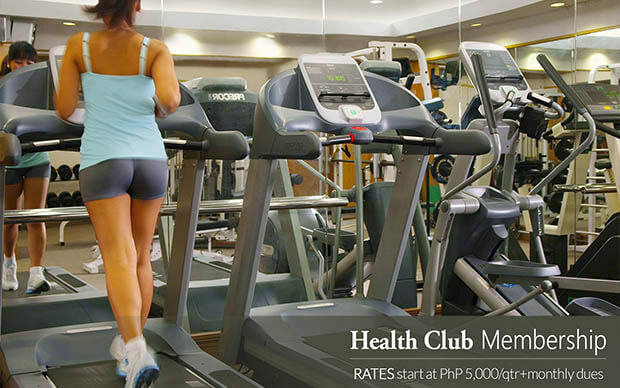 For inquiries, call the Health Club at (632) 638-7777.